At Grand Rapids Tree Service, we have been strengthening and reinforcing trees by installing cabling and bracing systems for over twenty five years. However, we find it to be one of our tree maintenance services that customers tend to have the least awareness of. In a nutshell, this procedure is designed to strengthen and fortify certain trees by restricting branch movement in windy conditions. To help out, here are four things that we would like our customers to know about cabling and bracing. Call one of our professional representatives today if you think the installation of a cabling and bracing system might be right for you. Some trees are otherwise healthy but grow “V-Crotches”, which is a branch formation that is prone to snapping under high amounts of stress. Cabling and bracing can help bring the structural integrity of these trees back to normal by restricting the twisting movements caused by wind that commonly causes these types of branches to snap. Please take note that the “V-Crotch” can be completely avoided by scheduling a proper pruning regimen in young trees. Grand Rapids Tree Service can provide any pruning, tree trimming, tree cutting or any other tree maintenance service that helps trees form strong structures while they are still young. True prevention starts when trees are first planted. The structure of a tree is highly integrated, where each branch works in tandem with the others to give a tree strength, balance and harmony. There are times when one main branch of a tree will fall or crack, which will in turn compromise the rest of the tree's main branches. The installation of a bracing and cabling system can serve as a replacement for lost limbs in a tree's system of strength and balance. This service can prolong the life of a healthy tree that has lost a limb and help prevent further branch failure. The installation of a cabling and bracing system will help protect any structures or other property in the vicinity of a tree. No matter how healthy a tree is, there is always the potential hazard of branches or the entire tree falling onto property such as cars, houses, garages, picnic tables and yard ornaments. While the preventative care in this case can seem frivolous, you might change your mind of you spoke to any of our previous customers who needed tree emergency services. As a rule of thumb, any installation of cabling and bracing will require an annual inspection with possible servicing by one of our arborists. The integrity of mountings and the condition of the equipment must be preserved in order for these systems to remain effective. Also, at best a cabling and bracing system can only be expected to last for ten years before having to be replaced. 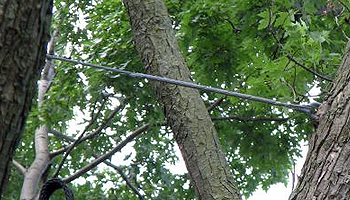 Although cabling and bracing is a very effective means of maintaining tree strength and protecting property, it is not the right course of action in every case with regard to cost and benefit. Some trees are too old or weak for the procedure to be effective. Some customers are not willing to deal with the extended costs of cabling and bracing. Sometimes there are more effective options when it comes to saving a tree or protecting surrounding property. Call one of our licensed representatives today for a free estimate. We can help you decide whether or not a cabling and bracing installation is a viable solution to your needs.